Over the past two days we have begun to understand better the impact of the work of previous archaeologists on the forum. We already knew that the plaza had been partially excavated in the 1920s and then entirely cleared in the 1940s, in preparation for the ill-fated world exhibition of 1942. Major restoration works of the 1960s are also marked by brick inscriptions. 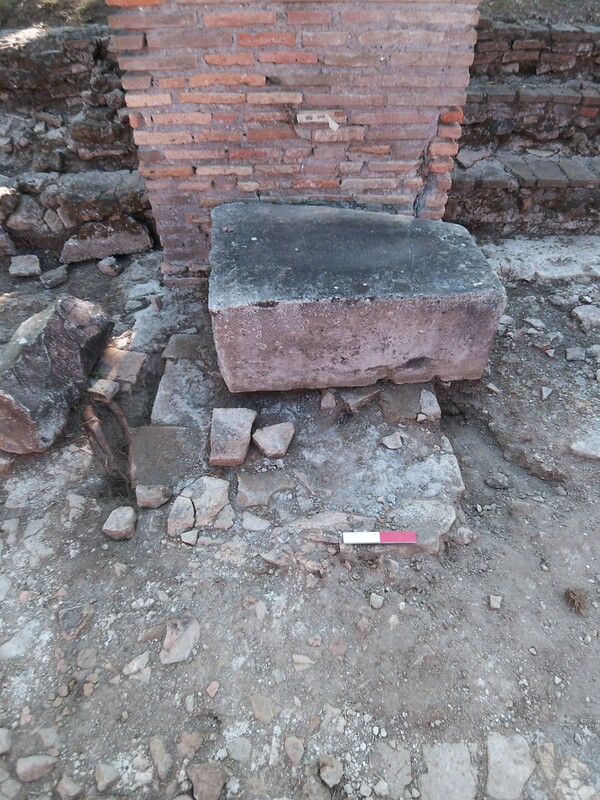 However, other restoration works have only been revealed by interviews with the workers of the sopraintendenza, and a careful study of the mortar, This is high quality for the Early Roman period, a little more fragile in Late Antiquity, and absolutely awful for the 1920s. However, despite our careful work there are still surprises. Late yesterday we discovered that there was modern mortar under part of the paving we took to be ancient, so a re-survey of the whole area is now necessary to distinguish new from old paving – though we are certain that much of the paving and its late repairs are ancient and in situ in many places. On the façade we can start to see that several of the huge stone blocks in front of each brick pier are (with one exception) not in situ, but cover a level of modern earth. Our cleaning has however revealed their original locations in three cases. Work has gone slowly today, due to the onset of rain, and also the absence of most of our volunteers. When they are on site the work really advances, and they have no qualms about doing the heaviest work. A new group of American students from California Polytechnic State University Architecture Program with Professor Tom Rankin has lifted morale – they are enthusiastic and hard-working. According to many of the team they are without doubt the best-looking group of people on the site, though this may not last long if they spend much more time sifting the mud with us. Lets hope it doesn’t rain tomorrow, as our marquee looked sorely tested by the wind and rain today, and the makeshift tent we built out of a tarpaulin and ranging rods was truly pathetic as a shelter for the finds-washers and dirt-sievers who carried on working despite the downpour. Thankfully my boss Ellen Swift arrived on a flying visit from Kent with a box of tasty Italian almond cakes before we abandoned the site for the day.